Plus a chance to win free games! Tomorrow morning, most of the over 47 thousand gamers who signed up for Extra Life will be embarking on a 24 hour gaming marathon to help raise money for Children's Miracle Network Hospitals. The Co-Optimus team is proud to be among them. Whether you're participating, gaming with us, or just spectating, here's what you need to know. The most important part of Extra Life is raising money for the kids! Sometimes it's hard to convince potential donors that your cause is a noble one, so I wrote up a list of myths I hear frequently, and explained why they aren't true. Check out Extra Life Myths Debunked to help your fundraising efforts. There's still time to join Extra Life, drum up more donations toward your goal, or to donate yourself! A 24 hour gaming marathon may sound like it's all fun and games, but doing anything for 24 hours is a grueling test of a person's endurance. If you're participating in the marathon tomorrow, it's time to make sure you're ready. A couple years ago I wrote an Extra Life Survival Guide that includes tips on eating right and keeping yourself going on game day. Drinking energy drinks or alcohol and eating nothing but junk food is a recipe for disaster. Check out the guide and run to the store to stock up before you set off on your journey. Do you need games to play tomorrow? Check out the Humble Weekly Bundle for this week. 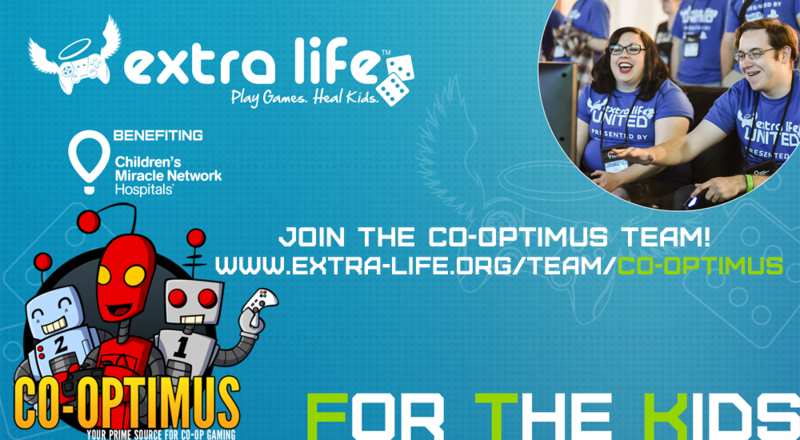 There's a handful of co-op games included, and a percentage of the proceeds go to Extra Life. As always, with Humble bundle, you decide how much you want to pay, and you can even set how much of your payment goes to the developers, Humble, or the charity. We're also giving away codes to various games on the Co-Optimus Twitch channel tomorrow, so be sure to check that out if you want some free games. Our team has currently raised $970 toward our goal of $2,500. We still have quite a ways to go. All donations made on participant pages go straight to the Children's Miracle Network Hospital they chose to support. The funds are used for research, state-of-the-art equipment, and even helping families who can't afford to pay for treatments. Donating is safe and easy. Just head over to the Co-Optimus team page, click on "Roster", pick a team member you'd like to support, then click "Support Me" on their page. We appreciate each and every donation regardless of the amount. Every little bit helps!